Do you need some last minute Thanksgiving ideas? I often wait until the last minute to come up with ideas for the holidays. Then, I do a quick search on pinterest and am overwhelmed by the projects – projects that require days to complete, lots of materials that I don’t have money to buy, and more “crafting” skill than I will ever have. This list is not like that. The ideas in this list can be pulled together quickly with inexpensive materials that you probably already have on hand. So, what are you waiting for? Dig into this list and pick one or two ideas to add meaning and enjoyment to your Thanksgiving this year. The simple and inexpensive Thankful Tree includes paper leaves for “thankful messages”. Short on time? Don’t spray paint the branches and do have people cut out their own leaves. Remind your spouse or another loved one in your life why you are thankful for them with this adorable Top Ten Reasons I am Thankful for You printable list from Crafting Chicks. This Thanksgiving Gratitude Project booklet from Alice Golden is gorgeous! I could see these booklets and the memories they contain becoming more and more precious as the years pass. All you have to do is have the printables and a camera ready. You can put the book together after the busyness of the holidays is over. 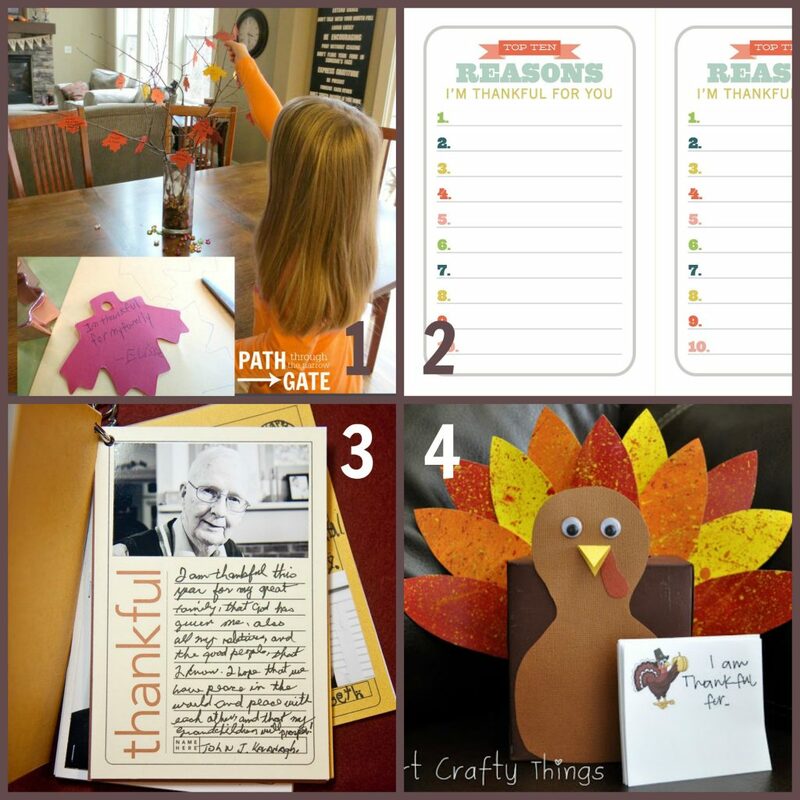 This super cute turkey thankful box from i heart crafty things is made from a kleenex box. He is begging to be filled up with gratitude cards. You would need to make the box ahead of time, but it won’t take long. 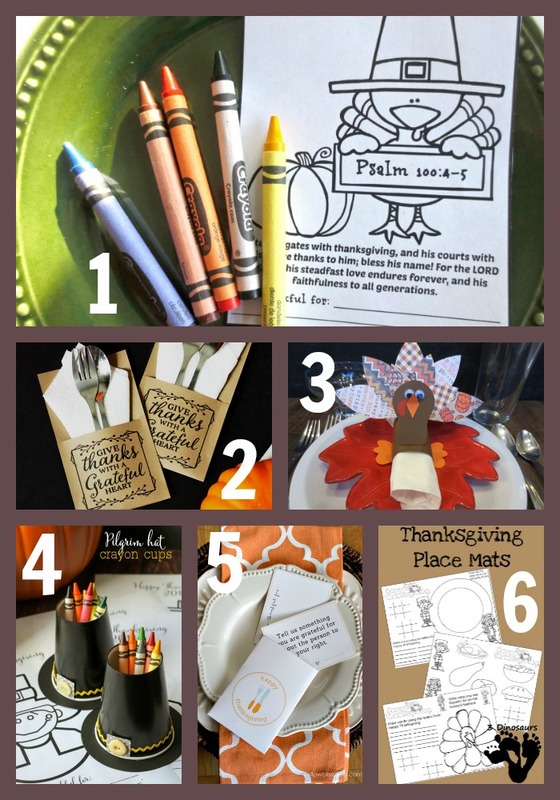 Welcome your loved ones to their very own places at the table with these fun place markers, each including a verse of Thanksgiving and a place for your guests to write their own thanksgivings. All you have to do is print them out! These beautiful printable utensil holders from Craftaholics Anonymous will add some class and a beautiful reminder to be thankful to your holiday table. Just print them and fold them. If you are going to include coloring or writing activities on your table, you will need something to hold the crayons or pencils. Solution? Super cute Pilgrim Hat Crayon Holders from Lil’ Luna. These will come together pretty fast. This adorable printable Thanksgiving Table Set from Yellow Bliss Road features utensil holders, “I am thankful” cards, and 8 conversation starter cards. 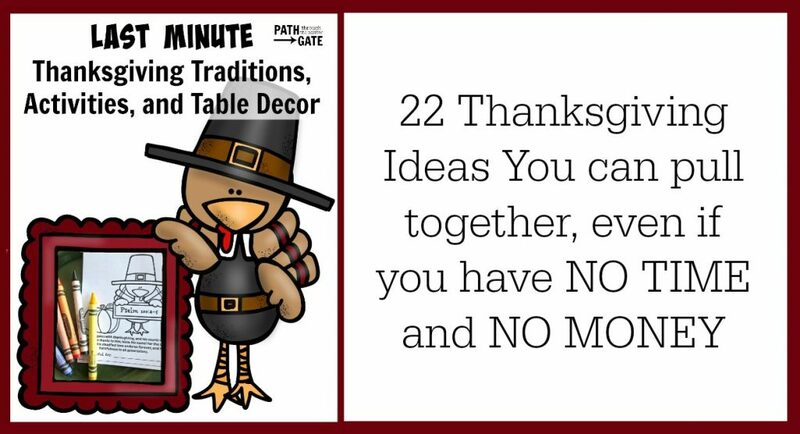 Need a quick and easy idea to keep kids entertained at the Thanksgiving table? It doesn’t get any quicker or easier than these printable Place Mats from 3 Dinosaurs. Adorable clothes pin turkeys and lots of running and laughing? Turkey Tag from Let’s Get Together sounds like a sure winner to me! This would take five to ten minutes to put together. Turkey Bowling from Make and Takes would be super easy to make if you already have plastic bowling pins, but could also be made with plastic pop bottles. If you are in a hurry, you could skip the feathers and just put the faces on the turkeys. 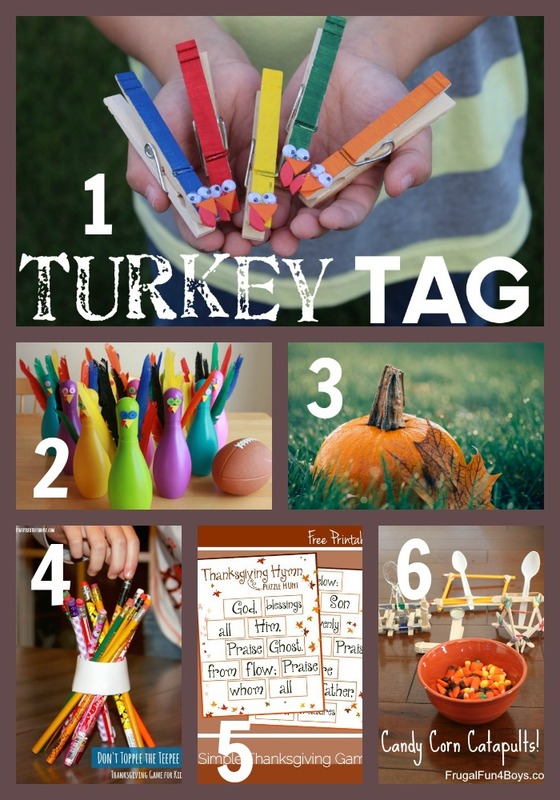 A fun Thanksgiving game that you can make in about thirty seconds with items on that you have on hand? Yes please! Don’t Topple the Teepee from The Inspired Tree House. This printable Puzzle Hunt from Not Consumed ends in a familiar Thanksgiving hymn sing. How fun is that? All you need to do is provide the rubber bands, plastic spoons, clothespins, pencils, bowl, and candy corn. Let the engineers at your party do the rest. (I have a feeling the adults might enjoy this one as much as the kids!) Here’s the link to Frugal Fun for Boys Candy Corn Catapults. 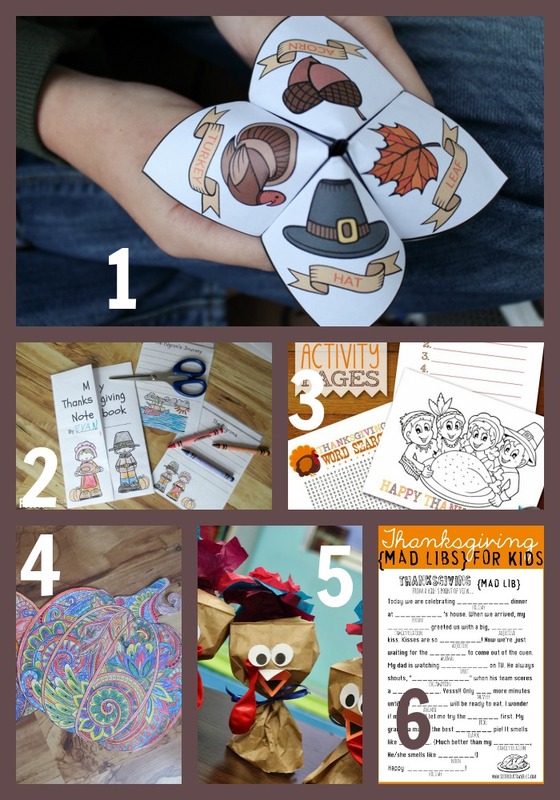 This fun paper craft activity from Bren Did is a great way to encourage kids to interact with adults and ask them questions. Just print the pages and show the kids how to fold them. This adorable Thanksgiving Notebook features a double-flap cover, adorable illustrations, and writing prompts, making it the perfect project to work on while waiting for the turkey to cook. These Activity Pages from I Should be Mopping the Floor include a Thankful list, coloring page, and (best of all!) a word search hard enough to keep older kids entertained for a few minutes. This Harvest Pumpkin Coloring Page from Homeschool Encouragement is perfect for older kids and might snag a couple of adults into coloring as well. My kids (7 and 9 years old) really enjoyed this pumpkin, and the results were beautiful. These Paper Bag Turkeys from Teach Them to Fly are so full of personality! Set up a Turkey making station to keep the kids busy. I have not done very many Mad Libs, but this Thanksgiving Mad Libs from Sister’s Suitcase looks like a lot of fun! I think my kids will have a blast with it this year. Which idea will you use this Thanksgiving? I would love to hear about it. Please scroll down to comment.